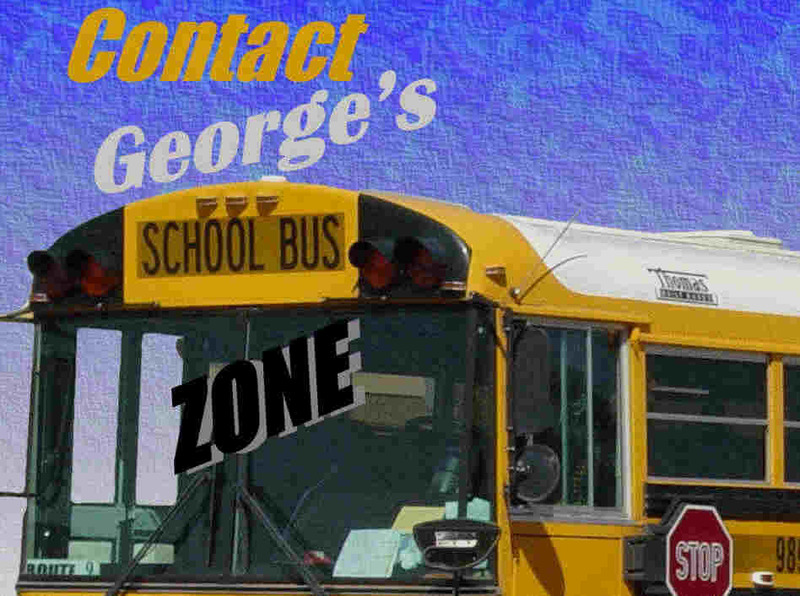 Welcome to George's School Bus Zone...where you can view pictures of school buses from the Clark County School District or other buses that are from or ended up being spotted in Clark County, Nevada!! And also some other information. The most information on the Internet about CCSD's school buses!! since we opened the gates on September 10, 2003!! Welcome to the School Bus Zone! Don't forget to sign my guestbook at the bottom of the page!! Don't be shy, anyone can!! I got a new E-Mail address, so please send all E-mails and Pictures to that address (at bottom of the page)!! Questions? Maybe they're answered on my FAQ's page. If they aren't, write to me at LVschoolbus@aol.com. New Stuff for this month, click HERE and scroll down and you'll see it at the bottom of the screen. Welcome to School Bus Zone, a website completely dedicated to showing you pictures of Clark County School District's school buses!! This web site has pictures* and information of school buses owned and operated by the Clark County School District (CCSD) in Clark County, NV. I DO NOT make any money from this site. It's done on my own time, and free for all to visit and learn from. CCSD is the 6th largest school district in the U.S. The average age when I last found out of a CCSD bus was around 6.6 years old. The oldest now is a 1991 that I've seen. In 2003, they bought about 100 2004 Saf-T-Liner HDXs from Thomas Built Buses!! But they retired about the same amount. If I am missing anything or if anything is wrong, please let me know on my contact form or e-mail me. I DO NOT sell parts and/or buses, this site is just a collection of pictures of buses. For bus parts, try searching online at google or ask the company the bus was built by. And on most of those sites there is a list of bus distributors. Right now, I can only take pictures or information about CCSD buses. It's because I have limited web space. I may eventually have pictures from all over the country in the future if I get more space. Check out my links page to view other great sites****. Enjoy the site! Click to see table of contents of bus photos from Clark County. Wow, lots of small print!! 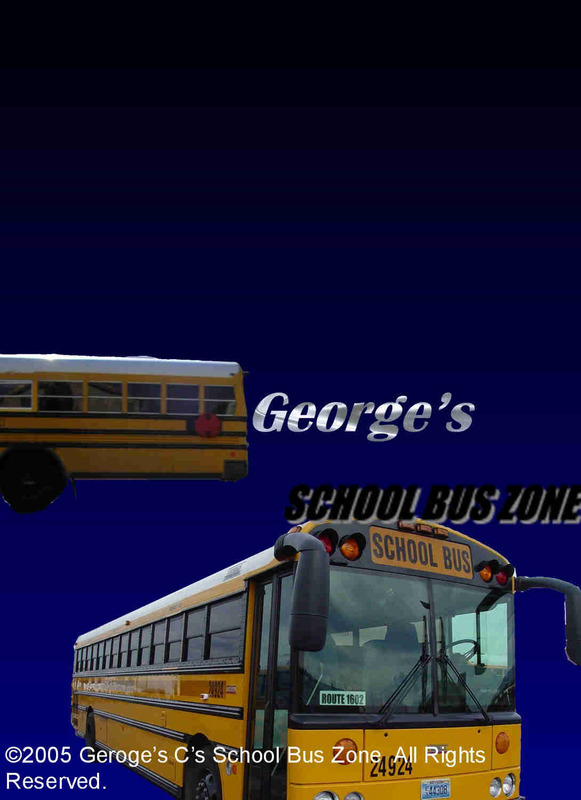 Pictures of my own that I've also taken have the "George's School Bus Zone (year)" mark on it. Those pictures belong to me, so please ask me before taking/using ANY pictures from any page on my site. DO NOT even link images to other websites or any other recorded forms. That is BANDWIDTH THEFT!! Bandwidth is how much data can be transfered from the server to your computer so you can view a web site. You can use photos, BUT don't sell them!! AND make sure credit goes to the correct person!! If you have any pictures while I'm gone, please E-mail me them to the address below (LVschoolbus@aol.com) the picture. Make sure they're CCSD buses please. Older buses and the Carpenter Cadets are great to submit!! Any CCSD bus could make it on here, new or old. I'll even accept buses you've caught and taken a picture of IN CLARK COUNTY, NV. I am not responsible for what you see when you click any external link on this site or any site. Those links are to sites owned by other people. And this website is not affiliated with any person, company, or district. This site is maintained/owned by the owner and does not make any money (Free server). Bus Manufacturers (Thomas, Blue Bird, and Carpenter are the only 3 named because of the bus models. They are named to separate the looks and styles of the vehicles. If those names are not used, people would look at it as "that bus" and not know what they're talking about. So then, what would the use of this site be without distinguishing names being used? It's to help identify bus models, not to make money. Thomas Built Buses, Blue Bird, Carpenter, and the Clark County School District do not pay to support this website. This site does NOT make any money from any company. If this site did, it would not be on here since that would violate the contract on the web site host to host this web site. I do not recommend clicking the advertised links that the web host uses to keep this site on the Internet. Basically, links from Tripod (web site host) are put on here without being chosen by me, and are not recommended by me. Clark County School District does not recommend or support any advertiser links (if any). I am not employed by CCSD. The links at the top and bottom are put in by the host, not by School Bus Zone.